Good afternoon, space fans! It’s been another week of excellence in orbit. Here’s what was up! The sun rises on another 16 mornings (per day!) in space. This week, a group of Earthling middle school students competed in the Zero Robotics competition that involved programming and orienting SPHERES robots (miniature satellites) aboard the station. The small satellites run on programs written by the students, and the competition involved maneuvering the SPHERES to different locations to complete challenges. Inspiring young people to get involved in aiding space is a great harbinger for future exploration! Can they program one to clean the space toilet? No humans want that job. Commander Jeff Williams and Flight Engineer Kate Rubins have been working in preparation for an upcoming spacewalk on August 19th, but both took the day off on Thursday to relax. The spacewalk will find the two astronauts installing the first of two International Docking Adapters, which will enable new commercial crew spacecraft to easily dock with the station. JAXA astronaut Takuya Onishi, who got the day off as well (in celebration of Japan’s new “Mountain Day” holiday) will be assisting the spacewalkers during their spin outside. You'll be able to watch the spacewalk live on NASA TV, right here! Formal dress for floating: astornaut Rubins dons her spacesuit in practice. 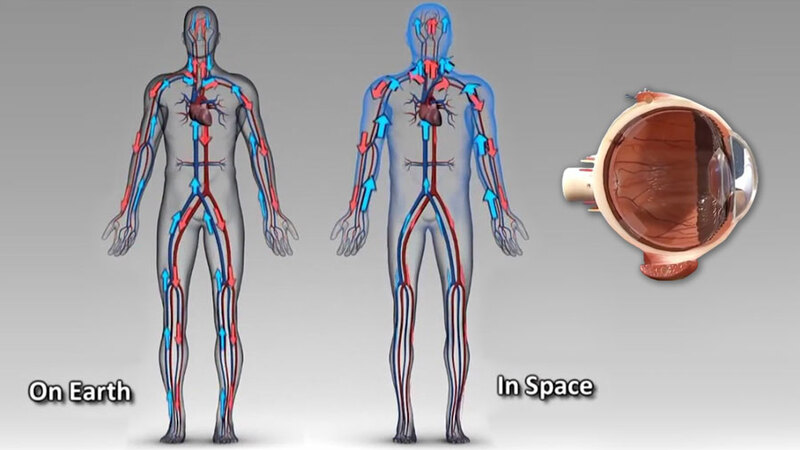 Rubins also celebrated seeing heart cells beating in space as part of the Heart Cells investigation, which assesses how the muscle tissue of the human heart changes in microgravity. By watching the cells expand, contract, and interact in the micro-G investigation, it could aid future diagnostic technology, drug screening, or cell replacement therapy on Earth…or maybe even on a long-distance space trip! 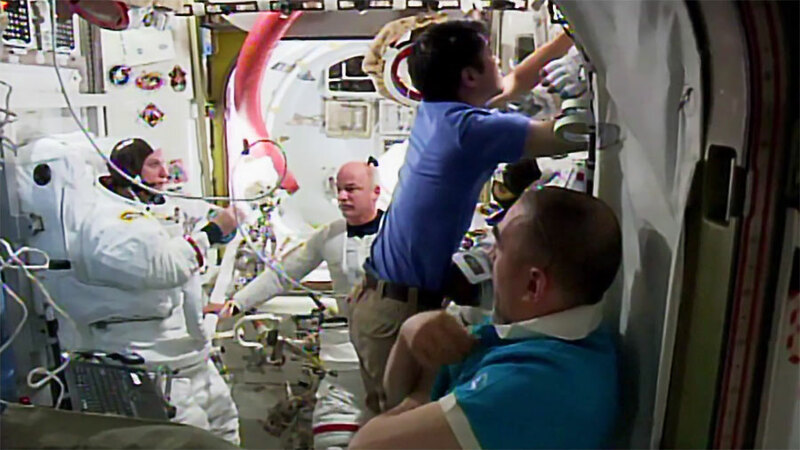 The cosmonauts kept busy as always, with second-time station veteran Oleg Skripochka sampling air and various surfaces in the Russian segment to search for errant microbes and ensure overall cleanliness. Alexey Ovchinin and Anatoly Ivanishin tested communication connections interacting with various systems in the Russian modules. The crew also collected biological and data samples for several experiments, including taking eye exams as part of the Fluid Shifts study. This study assesses the impact of microgravity on the human eyeball when the fluids of the body move around in micro-gravity. Findings could help improve ocular health for long-term spaceflight. Space does not care about your weak human flesh. And speaking of looking at cool things, Commander Jeff Williams captured even more spectacular space snaps this week! Take it away, Commander! "Bighorn National Forest, Cloud Peak Wilderness area." "Center of Badwater Death Valley National Park. That’s all for this week, space fans! Check in with us next week to hear about all the excellence involved in the extravehicular activity (that’s NASA-speak for “spacewalk”, landlubbers.) Watch this space! Don't you wish this was your Sunday brunch? 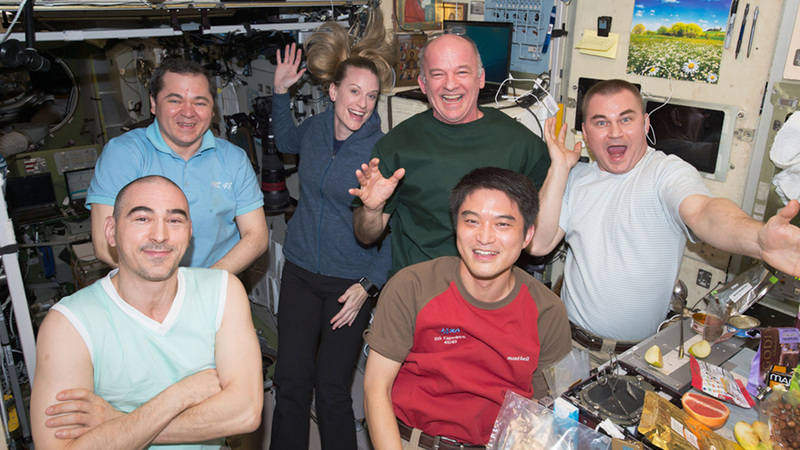 Gotta love the big happy space family.